Buy 10+ for £2.15 each. 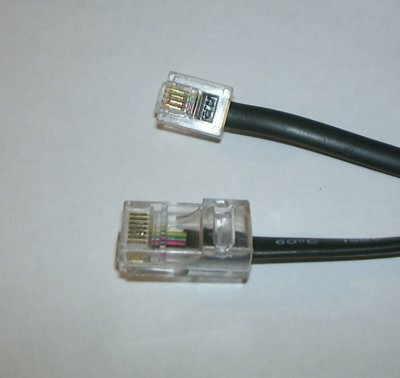 RJ11 to RJ45 cable to connect your DS9097U-009 or DS9490R host adapter to the first device on your network. Available in 1m or 2m lengths. If you want your first device further away that this from the host then we recommend you an RJ45 joiner to extend this cable with a normal ethernet cable. Please note that only the middle two pins on this cable are connected (1-Wire Data and 1-Wire Ground) so it will not pass the +5V power line from a DS9490R through to your network.